Indian Supreme Court Declares Privacy A Fundamental Right : The Two-Way In a milestone ruling, the nine justices unanimously declared, "Privacy is the constitutional core of human dignity." 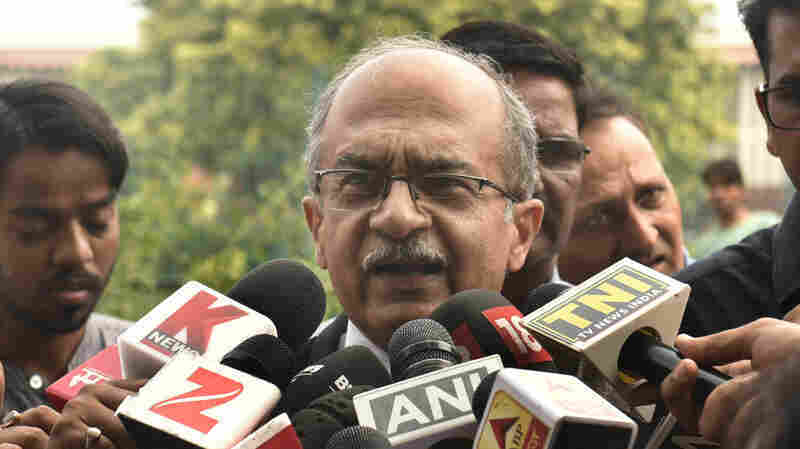 Senior lawyer Prashant Bhushan addresses the media about the right to privacy judgment at the Supreme Court on Thursday in New Delhi. In a milestone ruling, India's Supreme Court declared Thursday that privacy is a fundamental right for each of its 1.3 billion citizens protected under the country's constitution. India, the world's biggest democracy, joins the United States, Canada, South Africa, the European Union and the United Kingdom in recognizing that there is such a right. In India, it could have wide-ranging implications. For example, laws that currently criminalize homosexuality could now be struck down on the grounds that what consenting adults do is private. Nine justices unanimously joined the decision that was an exhaustive treatise on personal liberties. The 547-page judgment overturned earlier cases and declared, "Privacy is the constitutional core of human dignity." Chief Justice Jagdish Singh Khehar borrowed from former U.S. Supreme Court Justice Louis Brandeis and equated privacy with the "right to be let alone." Khehar wrote: "The right to be let alone is a part of the right to enjoy life. The right to enjoy life is, in its turn, a part of the fundamental right to life of the individual." Privacy advocates had petitioned the court over alleged data mining and challenged a government scheme that assigns every Indian a unique identification, through a so-called "Aadhaar" card. Critics argued the collection of biometric data in connection with the card was intrusive and could conceivably link up data to a person's spending habits, medical records and even bank transactions. The government said the scheme violated no civil rights. In fact, it had argued there was no fundamental right to privacy under the constitution. The government appeared to spin its position Thursday, praising the court's decision and saying privacy rights were fundamental but not "absolute." The raging controversy over the Aadhaar card is part of larger debate in India over enhanced government surveillance and how to protect personal information from falling prey to it. Saikat Datta, author and policy director at the Centre for Internet and Society, told the online Daily Hunt the fact "that the government is sitting on 1.3 billion Indians' information is a danger by itself. The government now has the enormous power to manipulate you" and thereby change what he calls the basis of the "social contract" upon which India was formed. The court reserved judgment on the constitutionality of the Aadhaar scheme for another bench but said, "In an age where information technology governs every aspect of our lives," the court "has to be sensitive ... to the opportunities and dangers posed to liberty in a digital world." And it called on the government to "put into place a robust regime" for data protection. Chinmayi Arun, who directs the Center for Communication Governance at National Law University in Delhi, called the decision "fantastic in many ways," but was disappointed that the court had not "tied the state's hands more conclusively." She said the court could have given more detail "on what the state can and cannot do." But Vickram Crishna, the lead petitioner in the case, told NPR he felt "bliss and joy, to be part of nation where the concept of human rights is affirmed as central." Crishna said the landmark decision would prevent intrusion into the personal lives of people. Amnesty International said the right to privacy that the court defended "is closely linked to the exercise of several other rights, from what people say online to who they love to what they eat," adding that the ruling could be "a game-changer." In fact, the court waded into the issue of sexual orientation, calling it "an essential attribute of privacy." It slammed an earlier Supreme Court ruling that upheld the criminalization of homosexuality on the grounds that the LGBT community was "a minuscule fraction of the country's population." The court said that was no basis on which "to deny the right to privacy." It added: "The purpose of elevating certain rights to the stature of guaranteed fundamental rights is to insulate their exercise from the disdain of majorities." The court said the question of privacy between consenting adults was not for it to decide; the issue of lifting criminalization of homosexuality is, the court noted, before another bench. But with the day's sweeping decision pronouncing India's fundamental right to privacy, nine justices loudly signaled the direction in which they believe India ought to move.